For the past month or two my Taz 5 has been jamming half way through prints. I kept cranking up the temperatures, from 205 to 230, but eventually that stopped working. I thought it was due to the cooling fan getting old, so I added the split duct to the cooling fan in increase cooling. This helped the problem, though print fails still happened whereas they almost never did before. Now, I replaced the cooling fan with a 40mm fan and I'm still having problems. It seems to be jamming after a couple of layers, barely extruding material. Sometimes it recovers, though sometimes it doesn't. 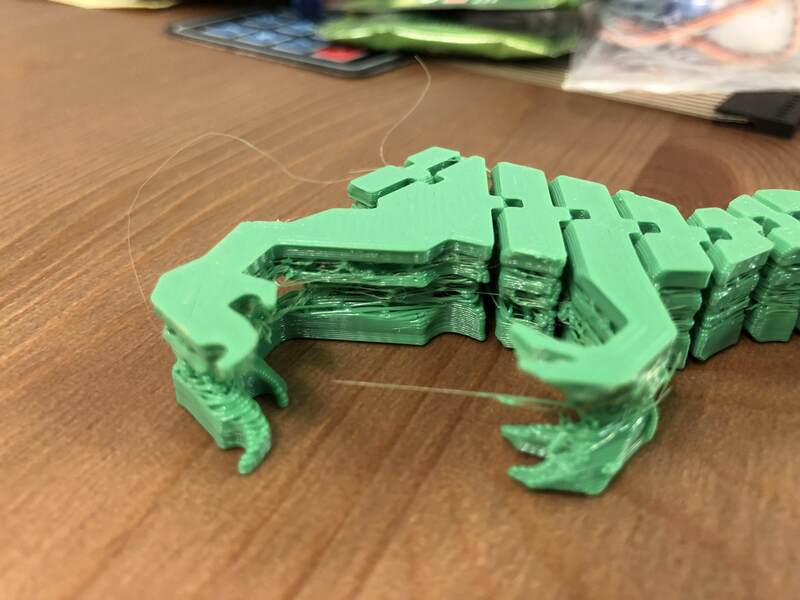 It may also happen more often when there's shorter layer times or more retraction. Could my thermistor or nozzle need to replaced? This print was done at a nozzle temperature of 228C. I haven't been able to figure out how to export settings from Cura 2.6. Thanks for any help! If you are printing PLA, it is probably a heat creep jam. The following changes might help. Cool the room the printer is in. Print at a lower nozzle temperature, if possible. Reduce retraction to the minimum needed to prevent blobs and stringing. Place a fan that will blow a gentle breeze in the direction of the printer. Check your temp graph during a print and make sure the hotend temp is being maintained. Overcooling with the part cooling fan can reduce hotend temp to a point extrusion is not possible. The Taz 5 is notorious for PLA heat creep jams. You are not alone. Ah, yes, I forgot to mention. I am indeed using PLA, specifically PolyLite PLA. Thanks for responding! I have been printing fairly successfully at 228C with a bed temp of 58C. The ambient temperature is otherwise pretty cool. I've ran into the same problems when printing thin objects that need a lot of retracting and jumping around. I check in every once and a while and the nozzle temp seems pretty consistent. I don't have anyway of recording a graph of the print temperatures currently. What retraction settings do you use if you don't mind me asking? Do you know if perhaps, the thermister could be getting old? Print it with 0 retraction then add retraction 0.5mm or 0.1mm per print until stringing is under control. You should be able to get by with 1mm or less, in my experience. What is a pretty cool ambient temp for you? Keeping the room at 75F or lower will help reduce heat creep jams. You could also try reducing the hotend temp. That filament probably doesn't need 228C. Try 205. What layer thickness are you printing? If it is really thin, try the same part at the thickest layer you can print with your nozzle and see if jamming is reduced. The general max layer thickness for a nozzle is around 80% of the nozzle diameter. This moves plastic through the nozzle at a higher rate. That reduces the heat creep problem because the plastic has a shorter dwell time in the hotend and doesn't heat and expand as much in the heat brake. If you are still running the tiny blower hotend fan, upgrade to something larger. There are solutions on Thingiverse. I asked about the hotend temp because some part cooling fan setups can over-cool the hotend when they kick on. 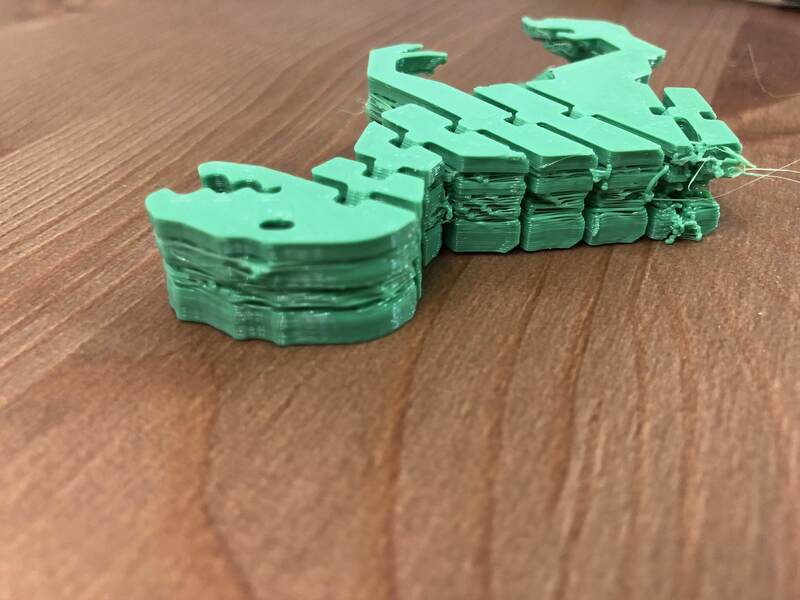 If you temp is staying within a few degrees of the set temp throughout the print, you should be ok there. I doubt you have a thermistor problem. Thanks for the retraction advice. I'm going to try that tomorrow morning. 205C used to be the temperature I print at, even lower sometimes. As the prints started failing I began increasing the temperature, which would work for a while until a few prints later I'd have to raise the temperature again. I'm printing a temperature tower now and it's looking like lower temps may be working better with the new fan situated. The ambient temperature is usually around 68C with no window light. The layer heights I usually use are 0.2-0.3mm. Only rarely do I go as low as 0.1mm. Thanks again for all the help. As a separate thought, do you think a worn out extruder nozzle may make heat creep problems more pronounced? My reasoning being that a nozzle that has a rougher inner surface may grip onto filament that is in the transition temperature due to heat creep. If you are actually having heat creep jams, the jam is happening up in the heat brake. If the filament in that are gets warm, it expands and sticks to the walls. So, the nozzle wouldn't have any effect on that. A heat brake that has a rough interior would make the jamming worse. If you have a 0.5mm nozzle, print with 0.4mm layers and see if the jamming is reduced. This will help sort out what is actually happening. Yea, I was thinking after I posted about what I said. I was thinking more if the whole hotend is worn and needs replacing. I did a couple of those retraction calibrations and reduced it greatly, receiving pretty good results. I'll dial that in more later. I'm currently working on temperature towers again. Unfortunately, the first couple jammed early on. After I get through those I'll try what you recommended with the 0.4 layer height. You mentioned you put a larger fan on. What was it? Sorry, thought I had responded to this. The fan is a 40mm 5V fan. I forgot the CFM off hand, but I want to say it's around 6 CFM. I've printed at .38mm layer heights and haven't seen any problems with jamming. I get them more at .25mm layer heights. I guess it's looking like heat creep? Maybe I'll try making a new fan shroud that has less static pressure?